California has taken another step at being ahead of the curve on renewable energy with the opening of their 2.8 megawatt biogas plant. The plant is the largest in the world and runs biogas generation, with all production on-site. Biogas is actually created through digestion of wastewater biosolids in an anaerobic process at the Ontario, California recycling plant. The location currently serves around 850,000 residents in the San Bernadino County area and produces a configuration of high quality heat via a CHP (combined heat and power) process. Using FuelCell Energy for the fuel cells, they then accomplish the biogas to electricity process, reducing the nitrogen oxide and sulfur dioxide particulate matter emissions by approximately seventy to ninety percent. While this biogas fuel cell power plant may be the largest in the world, it is not the only one in California. The FuelCell energy fuel cells are being used at three other power plants in the San Diego area where they make use of the wastewater treatment plant for the purified biogas. The growth of the fuel cell industry has been experiencing an uptick since 2011, with a 61% increase this year alone. The stationary large installations are diving much of the increase as governments, municipalities and businesses look to reduce their dependence on the electric grid and create their own energy. Some of the high profile companies that are investing big time include: AT&T (doubled their fuel cell installations), eBay, Owens-Corning, Apple, Staples, Google, Urban Outfitters, Coca-Cola, and Wal-Mart. 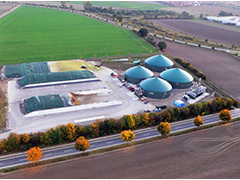 As one of the renewable energies, biogas offers a multiple use process of both clean energy and the reduction of waste. Big industry is seeking the kind of return on investment savings of both renewable and sustainable energy and, as with everything else, it is hoped that this interest will eventually reduce the cost, thereby allowing a trickle down process for more common use in communities. Posted on August 7th under Energy From Waste. Three cheers for California. We are always front and center for what some think are quirky ideas, but we also set the trend for the rest of the world. Making things happen is our specialty and we are especially good at global awareness. I see the biogas thing as a major coup for us and the rest of the country. I would love to see all of the nuclear power be replaced with biogas and other sustainable energy sources. Nuclear may be the most powerful, but it scares me. We could blow up the whole country and affect the world, throwing it into a state of destruction, with just one nuclear power plant. Not the same with biogas. This is nature friendly and doesn’t create stockpiles of radioactive materials, like nuclear. Pretty smooth move on the part of California to not only set up the power plant, but to make it the biggest in the world. If you are going to do something, make a splash and do it large. Seems like some other big dollar companies are looking to invest as well and, as with all technologies, once they all prove the point, the others will fall in line.